Rev. Joseph R. Plante, CSV, suddenly took ill on Nov. 12, 1927 and underwent surgery the same night. He died the following week, on Nov. 18 after complications developed. Fr. Plante, a beloved dean and teacher at St. Viator College in Bourbonnais, was 41. Fr. Plante was born in Lake Linden, MI on Jun. 4, 1886. He professed his first vows with the Clerics of St. Viator on Jun. 30, 1905 and his perpetual vows on Jul. 4, 1910. Fr. Plante studied philosophy and theology at St. Viator College in Bourbonnais, from 1910-1914. He was ordained to the priesthood on June 6, 1914 by the Rev. Paul Rhode, Auxiliary Bishop of Chicago. 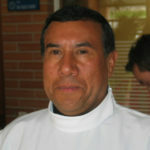 After his ordination, he did post-graduate work at the University of Chicago and later completed his studies at Catholic University of America in Washington DC. 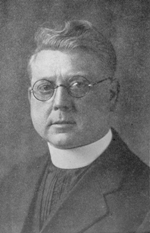 In 1917, he returned to St. Viator College as a member of the faculty. Because of his efficiency in math and science, he was soon made dean of these two departments. His zeal for the advancement of the community caused him to take a keen interest in fostering vocations to religious life and consequently, he was appointed director of the Juniorate as well. The body of Fr. Plante was brought to the college on Nov. 19 and from that time until the funeral on Nov. 21, his Viatorian confreres and the student body silently kept watch. The funeral took place at Maternity of the Blessed Virgin Mary Church in Bourbonnais where the Rev. Joseph D. LaPlante, CSV, uncle of the deceased, celebrated the solemn requiem Mass. Fr. Plante was laid to rest in the community plot at Maternity BVM Cemetery in Bourbonnais. The Rev. Walter J. Surprenant, CSV, provincial of the Viatorian Community, conducted graveside services.